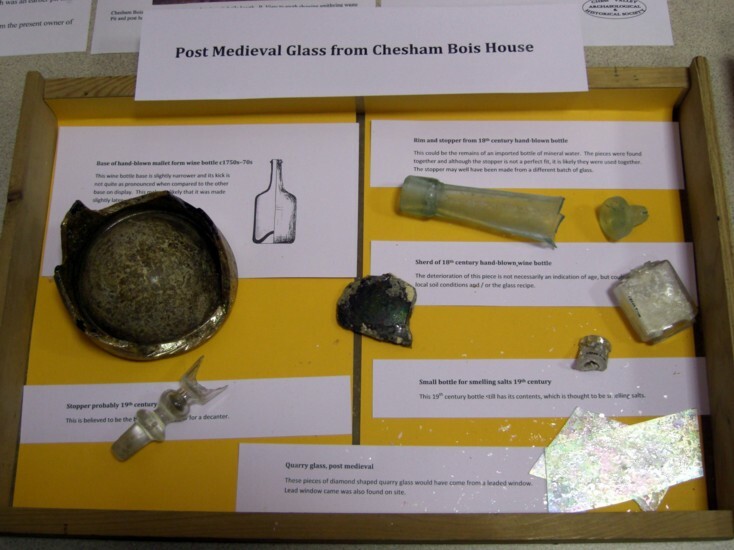 Chesham Bois House has provided the society with some fascinating digging and finds over the years. 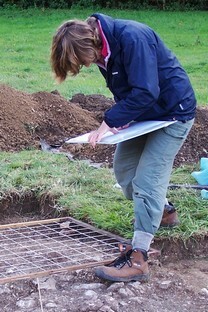 It was the subject of a Time Team programme involving CVAHS in May 2006, which can be viewed online on the Channel 4 website. In June 2012 we started further investigations, looking at features revealed by a new geophysics survey. As usual, Julia Plaistowe made us very welcome, providing ample places for undercover work and welcome refreshments. The dig got off to a good start with two days when the sun shone until early afternoon when it poured with rain. Initially three trenches were opened; trenches 1 & 3 on the lawn in front of the house and trench 2 on the south lawn. Trench 1 revealed building material and other objects from the old Chesham Bois Manor, dumped probably sometime in the early 19th C. All the bricks were hand made but varied in date, with about 40% derived from a building of the Tudor period. Several large metal objects turned out to be antique boot scrapers. 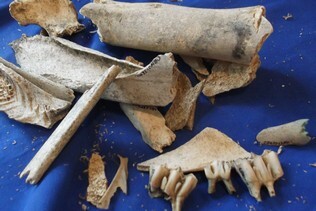 We were also intrigued to find a significant numbers of animal bones in good condition including the complete mandible of a large horse, cattle long bones and girdle bones and several sheep mandibles and long bones. Trench 2 also seems to have been an area of mixed dumping, but with signs of relatively more recent activity including a large bonfire. The oldest find was the base of a large punted bottle dating to c. AD 1650-1750. 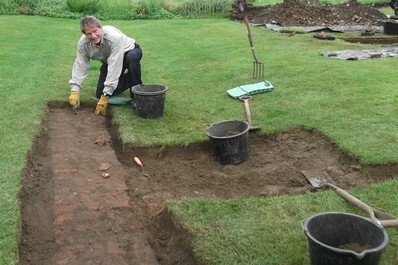 Trench 3 uncovered a substantial garden path made up of reused bricks, several bricks deep and running across the lawn for a considerable distance. Sad to say, the weather gradually deteriorated during the week and we eventually decided to close the dig two days early. We have for several years been interested in the possible existence of a "holy well" in the Sarratt Bottom area. There are records from the 14th C of a spring belonging to the Lord of the Manor at Chenies called Mayden Well and in the mid-16thC to a Holy Well field and Holy Well Lane. Early maps and records all show these to be associated with Holloway Lane, Mount Wood and what we know as Mount Wood Field. A spring in this area was mapped by CVAHS in the 1970s. 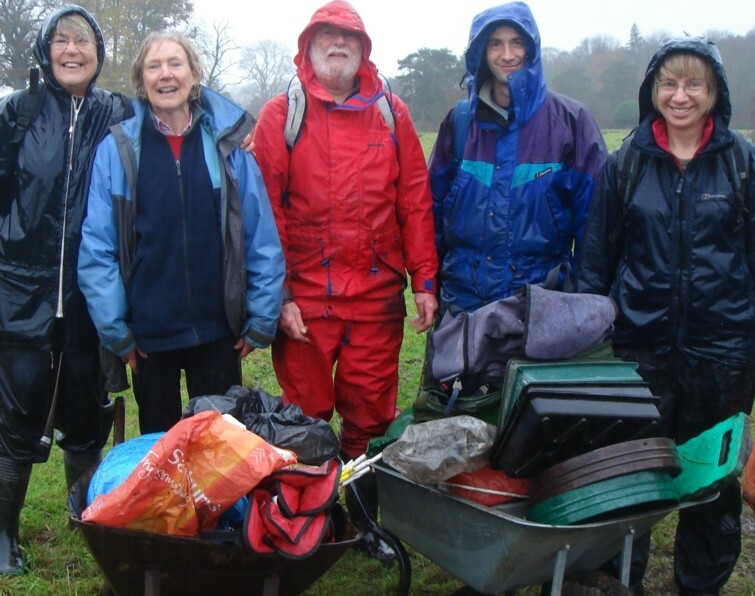 One of our team and a friend from the Chiltern Society kindly undertook to clear the area at short notice on a rainy day in May. Using the earlier CVAHS map and obvious signs of marshy ground, four hearty diggers put in an exploratory trench. Various challenging levels were first encountered, including a solid layer of nettle roots underneath which lay an even more solid layer of asphalt (which had been dumped over most of the field) together with large old water pipes and lumps of discarded clay. Once these relatively modern layers were removed we came down onto a scatter of small pieces of abraded Romano-British pot and animal bone resulting from downhill wash from the field slope above. At deeper levels, below a black peaty layer, larger pieces of pot and animal bone began to emerge from wet deposits, including large fragments of a mortarium, a horse mandible and femur, sheep bones and oyster shells. There were no signs of structures, votive offerings or coins that might indicate a site special to the Romano-British community living at Valley Farm. At about 1 meter deep, finds petered out and the trench began to fill with water. We concluded that this was not a holy well. The spring may have been used as a source of water for livestock kept in the higher level fields on this side of the river, and it also appears to have served as an occasional household rubbish dump. 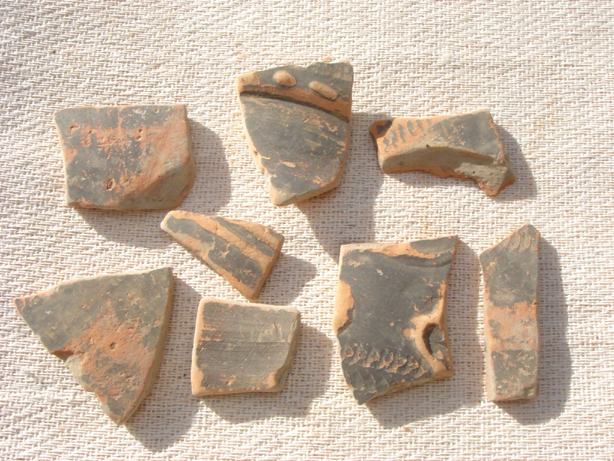 One of the commonest finds on most archaeological site are pottery sherds, which are extremely resistant to degradation once buried. And this is fortunate, as potentially these sherds can give the age of the site and tell us a lot about the people who lived there and where they traded. The only problem is that you need to know a fair bit about the local pottery throughout history in order to do a proper analysis. In CVAHS we have two approaches to solving the problem. We often take our pottery to specialists for identification, and we are also in the process of building a local Type Series. A Type Series is a collection of pottery from the local area that has been identified and dated. When a new shard is found, it can be compared with items in the Type Series to determine its likely date and provenance. CVAHS has been working for a number of years on a local Type Series for Romano-British pottery, as previously no such series existed for the Chess Valley area. The series now spans a wide range of dates and pottery types for this period and will be added to in the future. We also hope to extend it to include pottery from the medieval period. 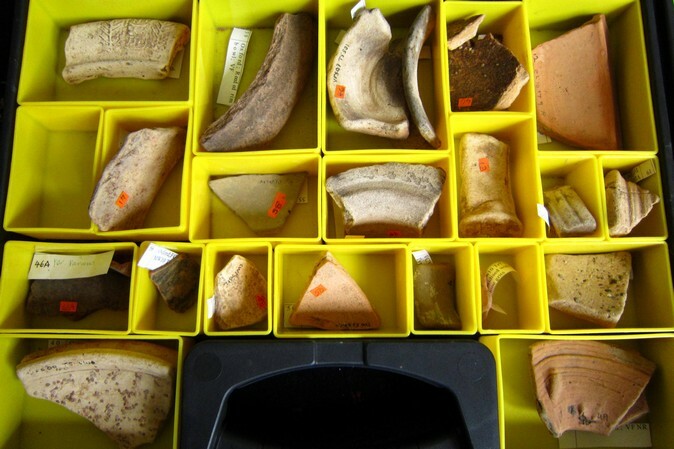 Ever wondered what happens to all those finds from our digs? Much of the CBM (ceramic building material) is returned to the ground after weighing and counting, but that still leaves an awful lot of pot, bone and other items. After a variable length of time in storage, these finds are catalogued for reference in the future. 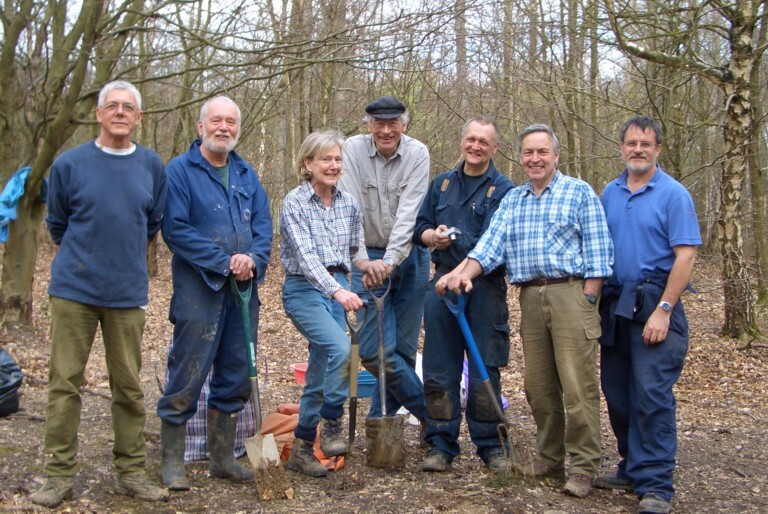 This is the task that a keen group of CVAHS volunteers undertook in late April when they sorted all the finds from our 2005-07 digs at Chesham Bois House. All finds bags were checked and we made sure all were clearly labelled with excavation code, trench and context number as well as a description of the content, e.g. bone or pottery. The bags were then placed in archival boxes and the boxes (seven in total) were then in turn marked with their contents and an accession number given to us by Buckinghamshire County Museum. And that is where the finds will be deposited, safely stored and available for research by any interested party in the future. The prehistoric earthwork at Whelpley Hill has special significance for the CVAHS Field Group as it was the first site we surveyed after the group re-formed ten years ago. The earthwork is circular with a diameter of some 100m and, in part, a pronounced outer ditch. There are two prominent entrances to the east and south east. It is recorded in the county archaeological records as an Iron Age hill fort, and scheduled by English Heritage. Our first survey in 2002 revealed a number of puzzling features. The site did not fit the classic range of Iron Age fort shapes, but it did have similarities with Bronze Age earthwork features in Eastern England, especially Essex. Some of these have been excavated, revealing fine ware pottery, domestic activity and extensive bronze smithy working. They are interpreted as Late Bronze Age enclosures possibly belonging to local chieftains, or were important ritual sites. If Whelpley Hill falls into this group it would be the most western one known to date. In February this year we obtained permission to conduct two further geophysics surveys. For magnetometry, we used a Bartington Gradiometer, a much more technically advanced and sensitive instrument than that used in 2002. We hoped this would show more details of potential hearths and pit sites. The second survey was resistivity, and was restricted to the eastern exterior where we looked for further evidence of the entrance zone and "track way". The combined results appear to further support the Bronze Age hypothesis, but only excavation will give us the evidence we need. To this end we are preparing a project proposal for English Heritage and the current landowner, with the aim of getting permission to dig during the 2012 season. 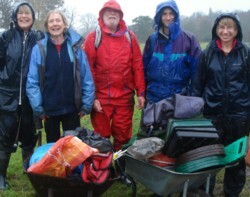 Our autumn dig for 2011 was at the earthwork enclosure at The Lee in the last two weeks of October. This site has long been regarded as the location of a deserted medieval settlement, but no previous excavation had been attempted. As previously reported, we have carried out both resistivity and magnetometry surveys within and across the earthworks. While neither of these convincingly identified buildings, there were a sufficient number of linear features and magnetometry hot spots to encourage further exploration by excavation. A report and plan of action was submitted to the landowner Mrs Stewart-Liberty who generously allowed us access to the land. The members of The Lee Old Church Trust were kind and helpful, allowing us to pitch the tent behind the church and to use their lavatory and small kitchen area. The dig started in weather that was exceptionally good for October - sunny and breezy – and there was a good turnout of CVAHS members. After several days digging, there were no clear signs of significant settlement, although there had clearly been human activity here in the past. a) A circular dump of unworked clunch (chalk/clay or soft limestone) blocks. This was used as a local building material and is visible in the walls of the Lee Old Church. b) Large quantities of iron working slag nodules that represent the unwanted leftovers after the metal fraction has been recovered. One of these were associated with a large dump of huge flints. While small areas of burnt clay were uncovered there was no significant evidence for furnaces on site. c) A brick feature associated with a low boundary of mortared flints was uncovered. This looks like the remains of a retaining structure, perhaps steps or a wall providing access to the orchard area that can still be identified today. 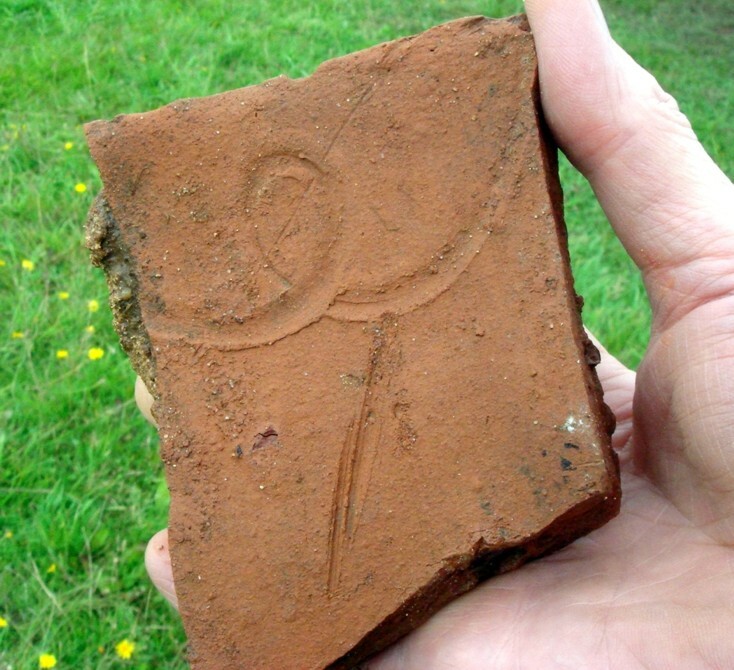 Some unusual post-medieval pottery was found here which might help with dating. We were particularly pleased that local people were interested in the project, took part in the dig and provided us with a great deal of interesting information about the history of the immediate area. In July we ran a two week excavation at the Roman Villa site at Sarratt, mostly in sun but with odd showers. This year we had the luxury of a double gazebo shelter for finds washing and recording, dining and chatting. A major objective was to explore in more detail the ‘pit’ which we had partially excavated last year. 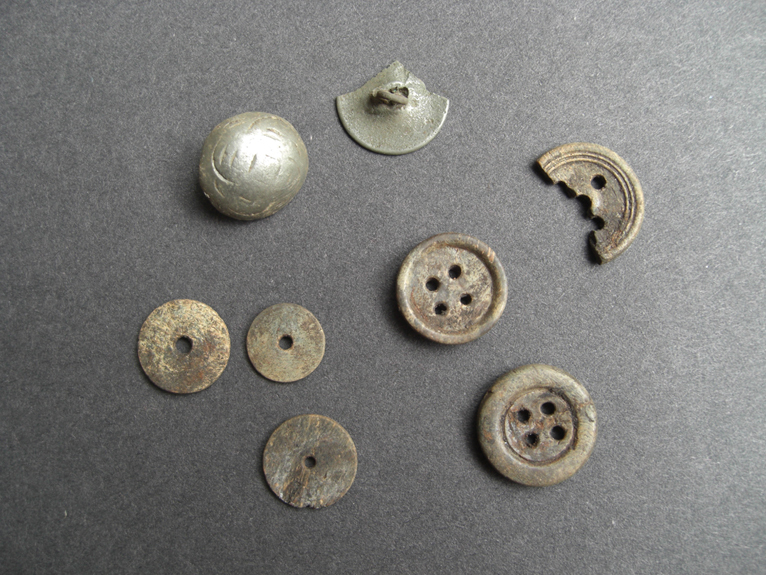 This feature yielded a number of coins, along with bronze and iron objects. Extension of the trench revealed that the ‘pit’ was a ditch running diagonally down hill. It appeared to be associated with a cut land-surface and nearby posthole. A rich mixture of pot, quern stone fragments, coins and copper alloy items were recovered. We also took a closer look at a series of ditches and banks forming a partial enclosure near the river in the adjacent wood. These were surveyed in the 1970’s but no excavation carried out. 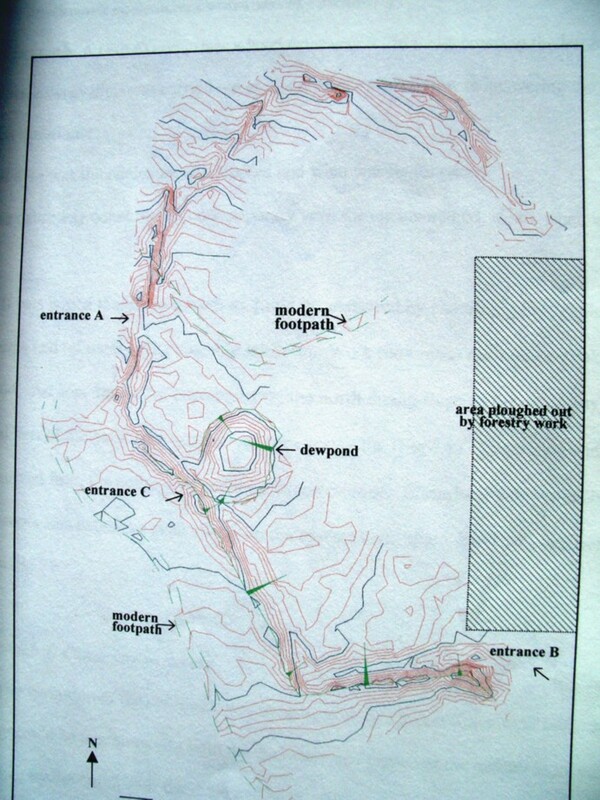 Two trenches were put across the ditches of the earthworks and good ditch profiles recorded. Llittle in the way of finds which might help with dating these features but one or two nice Mesolithic microflints emerged from the fill. While the excavations were in progress we also managed to complete the resistivity and magnetometry surveys of the field. So, combining all sources of information, we have a good overview of activities during and before the Roman occupation of this area. The CVAHS annual Open Evening was held on 18th March 2011 8pm in the grand surroundings of the council chamber in Chesham Town Hall. Around 80 people - members and non-members - gathered to hear presentations on recent society activities. 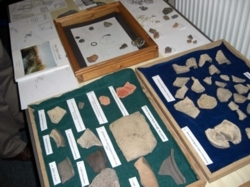 For the Field Group, Yvonne Edwards and John Gover described our digs and finds in 2010 at Mount Wood and Lowndes Park, while Marion Wells outlined the results of a comparative study of pottery from the Mount Wood and Colemans Wood sites. For the Records Group, Garry Marshall drew on extensive research to paint a picture how Chesham and its surroundings developed from Roman times up to the Middle Ages. 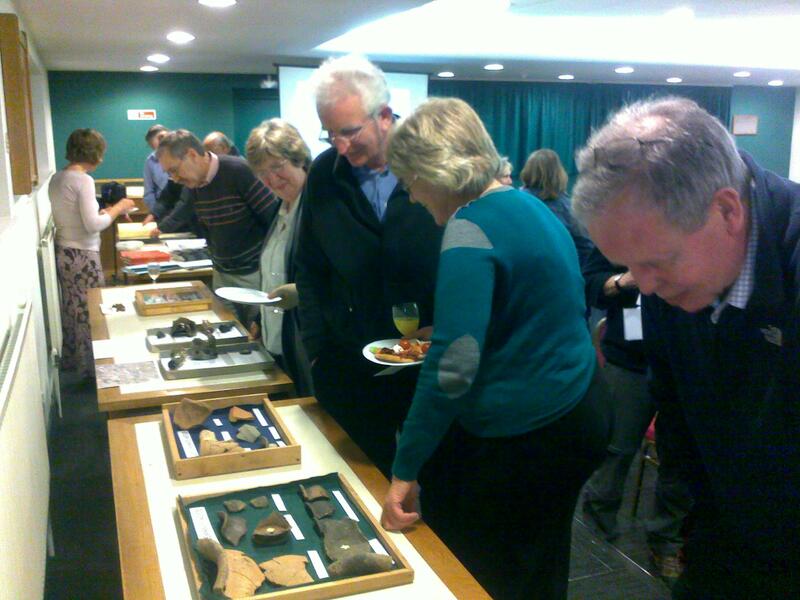 Attendees were then able to enjoy a range of finger food and drinks while looking at posters and displays of recent finds, while a rolling audio-visual presentation by Phil Nixon showed the Field Group in action during last year's digs. A big thank you to everyone who contributed to making the evening such a success. 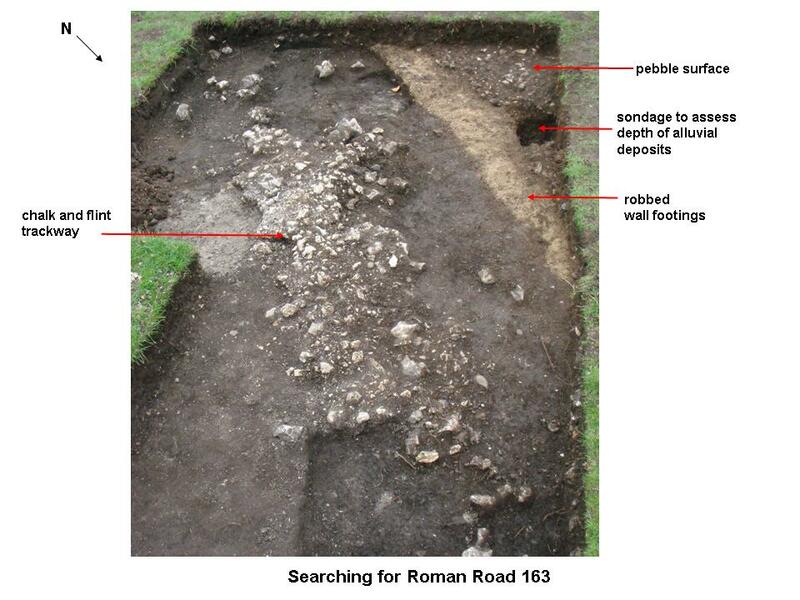 As previously recorded here, during the summer of 2010 CVAHS excavated the mound in Lowndes Park and uncovered a large number of broken glass bottles. We then had the daunting task of analysing these glass fragments - 3960 in all - to determine their ages and dates. Firstly, 3706 of the fragments were body sherds that were deemed too small to be useful for dating purposes, and so were discarded. Of the remaining 254 fragments, five body sherds could be dated to the post-medieval period, but more accurate dating was not possible. A stopper, thought to be from a pharmaceutical bottle, was dated to the early 19th century. 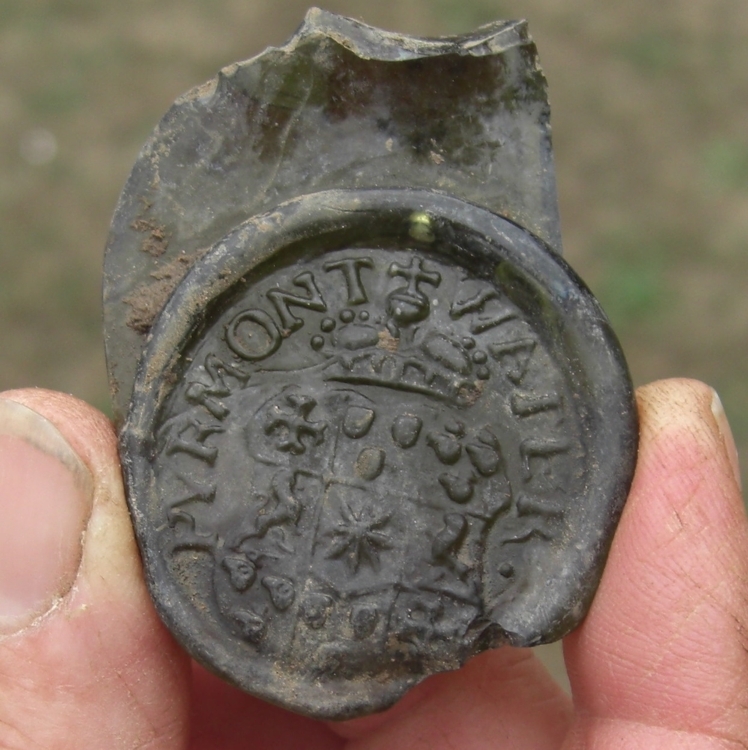 Five glass seals bearing the coat of arms of Welbeck-Pyrmont and the words 'PYRMONT WATER' were also recovered. We discovered that mineral water was imported in sealed bottles from Germany in the 18th century, and the seal type indicated that the seals had a date of c.1745-70. This left us with 243 fragments consisting of 86 bases and 157 necks of what we assumed were wine bottles, although no wine bottle seals were found. Since no complete bottles were recovered, dating of the bases and necks proved difficult. All appeared to be handmade which, again, made dating a challenge. For bases, the body shape, diameter, and kick-up height can give a clue as to the date. Similarly, for the necks, the shape, width of lip, and type and position of the string-rim, can be used to give a rough date. We measured all the fragments, grouped them, and allocated tentative dates. We then visited Will Phillips, Keeper of Social History at Buckinghamshire County Museum's Resource Centre with a selection of 25 bases and necks. There we were able to view the museum's collection of complete bottles and Will very helpfully confirmed our dating, which we were relieved to find was not too far out. The majority of the glass bases (69 of the 86) and necks (124 of the 157) have now been dated to c.1770-80. 11 bases and 25 necks have been given earlier dates, the earliest being c.1650-60, and 6 bases and 8 necks have been given later dates, the latest being c.1800-20. So, in conclusion, all we can say at present is that a large number of broken bottles, dating mostly from the 18th century, were buried in the mound. 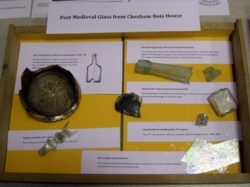 But the mystery remains as to where the bottles came from, whether they were deliberately smashed, and why they were carried to the top of a hill in Chesham and buried. 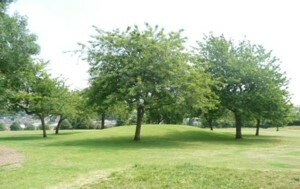 The mound in Lowndes Park is scheduled as a possible Bronze Age burial mound but excavations by CVAHS in July 2010 uncovered no evidence to support this idea. There was no signs of encircling ditches and all the finds made in the three trenches placed on the mound found only post-medieval items. 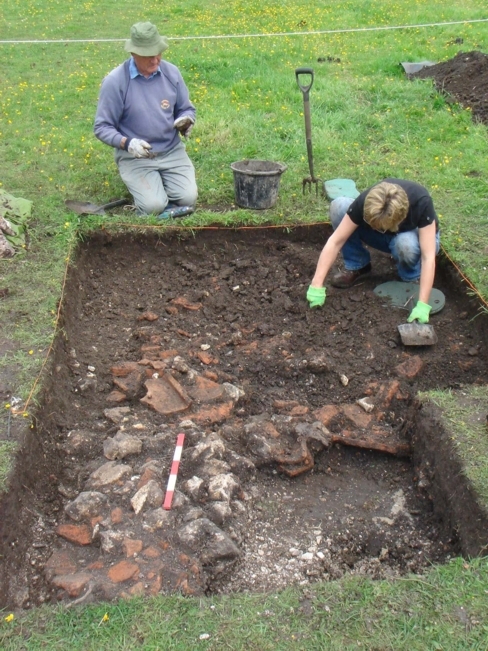 The trench on the upper flat surface of the mound uncovered part of a pit where large quantities of tile, glass bottle fragments, pot and bone dating from late 17th century to early 19th century had been deliberately dumped. The dates suggest that some or all of this material may have come from Bury Hill Manor, the home of the Whichcote and Skottowe families since 1656, which was demolished in the early 19th century. The majority of the glass came from wine bottles, but there were also fragments from bottles of Pyrmont mineral water imported from Germany, which was highly fashionable in the 18th century. There were bones from cattle and sheep showing signs of butchery, presumably the remains of hearty meals; in addition there were the remains of a young cat and a tortoise(?) Perhaps these were pets at the Bury Hill Manor? At the base of the pit were rough rectangular brick foundations for a small building. These may be the base of a gazebo/look-out pavilion from which the Skottowes enjoyed views along the Chess and Pednor valleys. From the mound, Chesham people and visitors still enjoy these views today. For a week from the 23rd July, CVAHS carried out excavations in Lowndes Park Chesham on the "rolling pin", an earth mound at the highest point of the park. We dug trenches into and on top of the earth mound, which was scheduled in 1995 as a possible disc barrow. A series of trenches were also placed across a large enclosure ditch/bank identified from aerial photographs. The hot dry summer had baked the ground so that it was hard digging but we made good progress with the aid of pickaxes and perseverance. Enough information was generated from the enclosure trenches to confirm the presence of a large bank and shallow ditch. There were very few finds from these trenches but one yielded the bowl and stem fragments of a clay pipe. 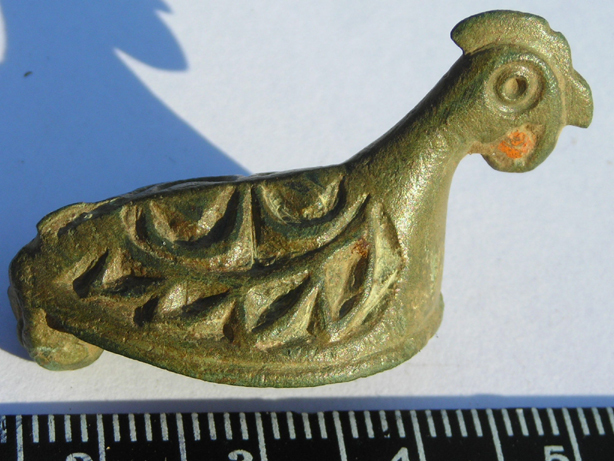 No other finds were made in the enclosure trenches to suggest a medieval or earlier date. Trenches on the mound exposed a number of interesting features but evidence for a prehistoric date was absent. Rather the finds (including a large number of hand blown bottles) indicate a date somewhere between 1750 and 1850AD. However it is worth noting that the CVAHS dig was confined to a small percentage of the total volume of the mound. Once the finds have been processed, dated and catalogued and the reports assembled more details will be made available. From February to April this year the CVAHS Field Group ivestigated the site of a possible deserted medieval settlement at The Lee. We used resistivity and magnetometry geophysics to form a picture of sub-surface features. Although the earthworks at The Lee cover a fairly large area, there is comparatively little known about them. No previous excavations or surveys have taken place at the site, but there have been two site visits. One, by Roland Smith, resulted in a sketch showing features such as possible house platforms and short lengths of hollow way. 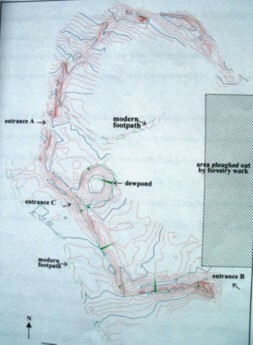 A site visit by Pike and Farley (1977) resulted in an annotated map which shows additional small spurs of bank and ditch to the south east and west. Michael Farley stated that "within the enclosure, apart from the church/chapel, would have lain the principal house and its attendant barns and outbuildings and possibly a few other dwellings. Much of the enclosure would have been open land, the normal 'home close' of a principal house". Records suggest that this was a 13th-14th century monastic site consisting of a church and a possible guest house. But what else was here, and is there any evidence of an earlier occupation? Geophysical surveys of the site have now been completed and indicate some interesting features. We are hoping to be able to begin excavation of these in the near future. About 50 CVAHS members and local people braved the wind and rain on 19th March to come to Chesham Town Hall and hear about the society's activities in the past year. There were short presentations by members of the Field Group - John Gover, Jill Hender, Yvonne Edwards and Marion Wells - on our archeological activities at a number of sites. These included new investigations at Lowndes Park, Chesham and at The Lee medieval settlement, as well as the long-running fieldwork at Valley Farm and surrounding areas. Yvonne Edwards described all these as 'work in progress' as each has produced new information (and, in some cases, physical finds), but more work is needed to understand and date activities on the sites. Garry Marshall of the Record Group gave an entertaining presentation on 'The Great and Good of Chesham' derived from his study of Chesham's manorial rolls. He demonstrated how local people in the 14th Century were linked in a web of relationships and obligations, from the level of the aristocracy down to individual peasants. Finally, Roland McLain-Smith described recent developments at Coleman's Wood, where evidence has been found of Romano-British and earlier activity, including traces of a new bank and ditch enclosure. 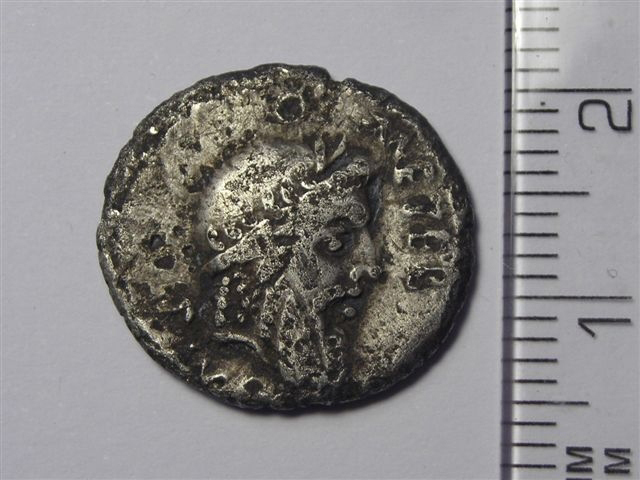 The Romano-British finds may be linked to a suspected villa at Little Missenden. Displays included finds from Coleman's Wood and an accompanying video, pottery from Valley Farm and environs, and posters about our geophysical survey at Blackwell Hall Farm. Blackwell Hall Manor was in the Chess Valley near Chesham. It derived its name from the Blackwell family who held land in Chesham in the 13th century. The Sites and Monuments Record (SMR) states that "Blackwell Hall marks the site of the ancient manor of that name", however, it's not clear whether the manor was based on what is now Blackwell Hall or Blackwell Hall Farm. While CVAHS was researching Blackwell Hall Farm a large flat platform area was noted in the back garden to the east of the farm. Was this the site of the original manor house? In February 2010, we decided to complete a resistivity survey over this feature and surrounding area to see if any evidence could be found to support this idea. The results and interpretation of the survey are shown below. The raw resistivity data is as taken from the resistivity meter with no processing applied. After relief processing, the plot has 'noise' spikes removed and the display highlights anomalies. 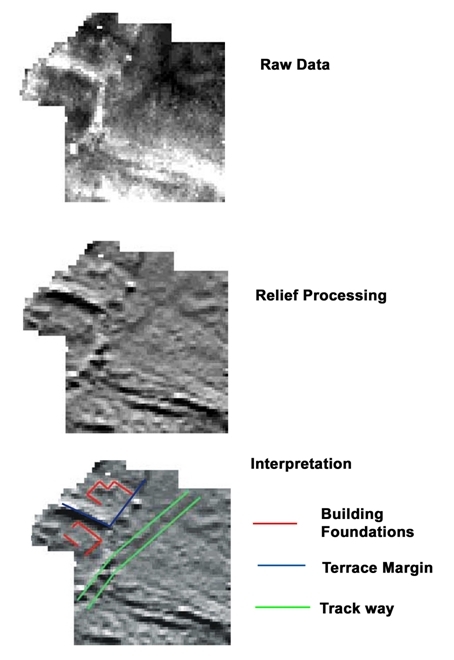 An interpretation of the data is shown, including the margin of the platform terrace (a small but steep bank on the site), a trackway, and possible outlines of building foundations. Interestingly, the 1880s OS map shows a building on the platform. But are we looking at 19th Century "garden sheds" or is there something older here? As usual, more research is needed! "Over the past year we have managed to transcribe and translate a fair selection of the early Manor Court rolls, and then to interrogate them to see what they tell us about medieval Chesham. We have published articles about the work and our findings, and also given talks to local groups. Two articles have been published in the CVAHS Journal. These are essentially introductions to the Manor Court records and what they contain. An article has appeared in the Records of Buckinghamshire for 2009 entitled "A glimpse of life in early 14th century Chesham as revealed by its Manor Court rolls". This is based on the court records for the years from 1308 to 1315, and paints a picture of a conservative rural society dominated by feudal procedures. A further article has been submitted to the Records of Buckinghamshire that is based on the records for 1348 to 1350 and reveals something of what was going on in Chesham at the time of the Black Death. We have given talks on the same topics as the published work to the two Local History groups of Chiltern U3A and also to Amersham WEA. Work is in hand on the records of the smaller manors of Chesham, notably The Grove and Blackwell Hall. The main aims of this work are to illuminate the roles of the smaller manors in the wider Chesham area, and to examine the relationships between the different manors." 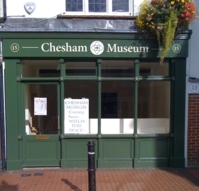 Chesham Museum is about to get bigger and better. 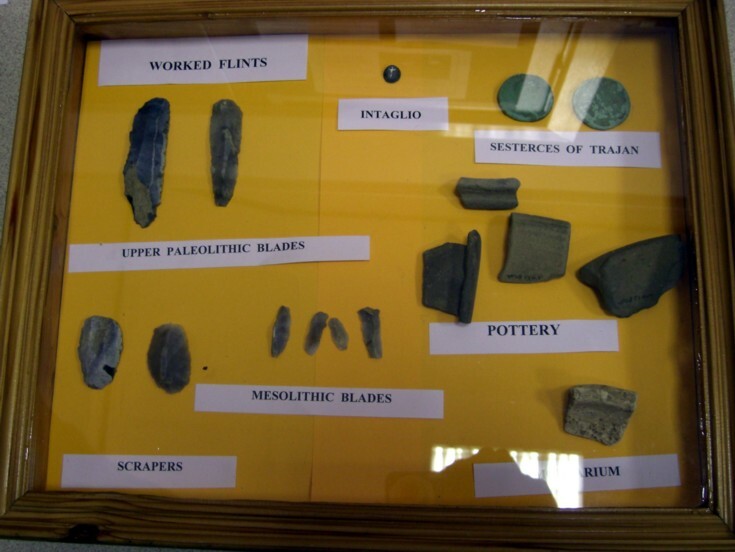 The museum focuses on local history and archaeology and has been established in the town for some years. It has now outgrown its original home in The Stables, and the trustees have now signed a new lease on 15 Market Square, formerly Chapter One bookshop. The premises have been completely refurbished and on 1 September the cabinets and artefacts were moved into their new and expanded home. The museum will open to the public on 6th October with an official launch later in the month. CVAHS are supporting the museum by input to the archaeological section and by financial donation, and we also hope to make CVAHS publications available through the museum's bookshop. With the kind permission and co-operation of Chesham Town Council the Chess Valley Archaeological and Historical Society has completed a survey of a mystery mound in Lowndes Park, Chesham. The earth mound is about two metres high and surrounded by a ring of trees. Over the years there has been much speculation concerning the origin of this feature. Possibilities include an 18th to 19th century landscape structure; the foundations of a medieval windmill; or possibly a burial mound as old as the prehistoric Bronze Age. 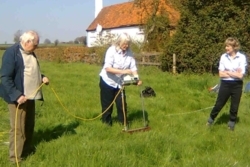 The Lowndes Park site is a scheduled monument and we are not allowed to excavate, but we were able to complete a geophysical survey using a resistivity meter. 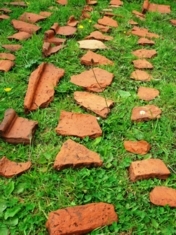 Our survey was done as part of "The Festival of British Archaeology Week". This week is an annual event to encourage public interest and investigation in matters archaeological. We carried out our work on 17th and 18th July and were greatly encouraged by the number of visitors. 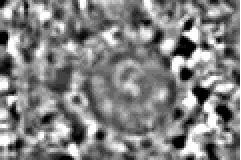 The survey results show a near circular structure some 22 metres in diameter enclosed by a thin partially complete darker coloured ring. We interpreted this as a narrow ditch surrounding the mound. Outside is an irregular spaced series of small dark anomalies. These are in no way ancient but the result of the various trees planted at the site. Finally the mound itself is relatively featureless except for the "D" shaped feature on its crest. From the geophysical data this mound exhibits many of the characteristics of an ancient bowl barrow with its circular shape and ditch. Such barrows date from the early Neolithic but their peak of construction was during the late Neolithic and early Bronze Age (2400 - 1500 BC). They were built to house burials in pit graves and were accompanied by various grave goods, ranging from everyday household items to prestige jewellery and weapons. In general these barrows seem to be concentrated on higher ground and the Lowndes Park mound is no exception being sited on the upper part of a hill slope. We know that many such barrows were re-used for other functions, including foundations for windmills. Whether this was the case here cannot be determined from the geophysical evidence, but the presence of the "D" feature is intriguing. What is its origin? Can it be associated with a windmill or some other structure on this site? In conclusion, our survey proved to be very fruitful. The available data is consistent with the mound having a prehistoric origin, together with later use of the site. We may be able to give a definitive answer after further investigation and excavation, but that is a story for another day. In late May CVAHS organised a four-day dig at the extensive Romano-British site near Sarratt. We had previously investigated this site in August 2008 (see report below). About 18 CVAHS members attended over the four days. This dig was in a new area, about half a mile from the August dig site. We looked at locations where features identified by geophysical survey had been noted, and also places where finds had been found on or near the surface. Investigations were complicated by the proximity to the river. For instance, some areas of high resistance on the geophysical plots were found to be deposits of pebbles/flints, while lines of low resistance were shallow ditches, probably dug in the past few centuries for water management. The latter might have been for flooding water meadows in spring or possibly for cultivation of watercress. A further complication was the presence of inquisitive horses in the field, but we were able to keep them at bay with the society's newly acquired electric fence. Despite these minor challenges, we uncovered a large amount of Romano-British building material, including roof tiles, and faced flints, as well as some large fragments of unabraded pottery. This was in a layer between about 30cm and 70cm of the surface and appeared to be a dump of building demolition material made during the Roman period. Overall, the dig provided further evidence for the physical and temporal extent of this fascinating site. We will be continuing to survey and excavate here during the remainder of 2009. A very well attended Open Evening in March 2009 heard talks by members of the Field and Records groups on their activities in the past year. John Gover and Marion Wells described the exciting finds from our summer dig at Sarratt where we uncovered evidence of significant Romano-British occupation, as well as human activity spanning at least 16,000 years. 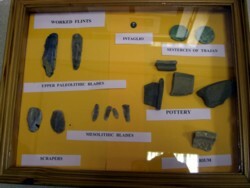 Numerous items from this exploratory dig were on display. John also described our new Wenner Array that we used successfully at the dig, while Yvonne Edwards covered our exploration of the burnt mound near Latimer. Finally, Garry Marshall, Jill Hender and John Dodd gave a series of presentations about the society's ambitious new Chess Valley Landscape Project, investigating changes over the centuries. They explained that it helps if we can divide the area into natural units, and Blackwell Hall near Chesham has been selected for initial study as it forms such a unit, both as a farm and as a manor. The ongoing project will involve contributions from both the Field and Records groups. In early November, CVAHS got the go-ahead to make a preliminary investigation of a burnt mound site on the river Chess. Burnt mounds are common in Ireland and Scotland but not so common in Britain. Most are associated with a good stream or river water supply, hearths and a large trough. The troughs, that are thought to have held water, are sometimes clay-lined or wood-lined. Radiocarbon dates for these mounds vary quite widely, ranging from the late Neolithic to the Iron Age, but most between 2000 - 800BC during the Bronze Age. The mound is made of heat shattered flints which are thought to be the remains of stones heated in fires and subsequently used to heat the water in the trough. There are various theories about why this was done - possibly cooking, bathing, dyeing or leather treatment - but no general agreement as yet. Our test excavation spanned four days (contending with some very wet and windy weather) and enabled us to make a section through the mound and uncover the underlying surface of river deposits. We also recovered pieces of crude pottery and some fragments of charcoal. The pottery fragments have been examined by a specialist and identified as late Bronze Age (1,200-800BC) jar fragments tempered with flint. 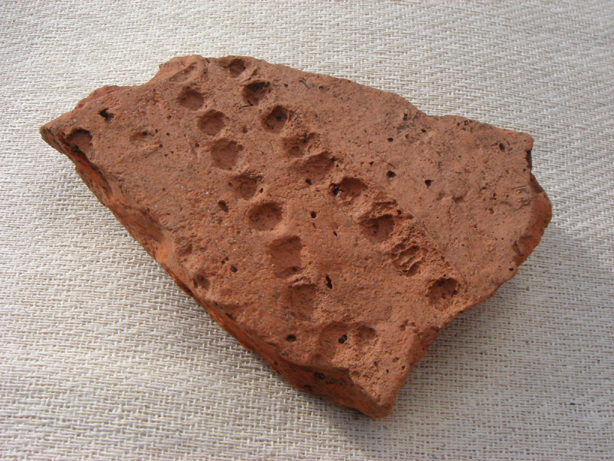 One of the pieces appears to have slight finger impressions in the surface, which is very common in Bronze Age pots. We found no trace of a hearth or trough during this initial excavation, but we hope to return in the future for a more comprehensive investigation. 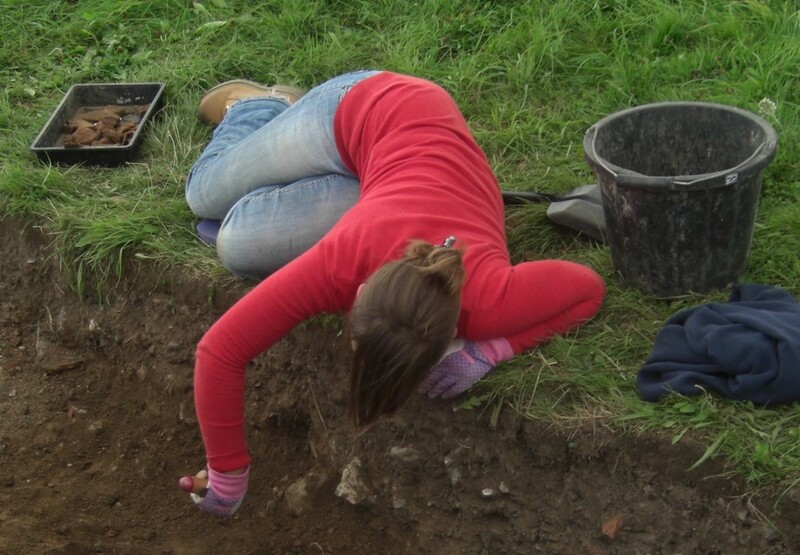 This summer's dig took place on 18-26th August at a suspected Romano-British site near Sarratt. Around 20 CVAHS members and guests came over the nine days. Test trenches were dug and uncovered evidence of possible enclosure ditches, dumped building material and pottery all dating to the Romano-British period. 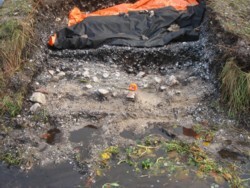 The three trenches were positioned in order to examine features that we had previously identified by resistivity survey. These included what looked like a large rectangular area enclosed by a ditch and possible traces of a small building. We succeeded in finding the ditch in the two trenches where we looked for it. 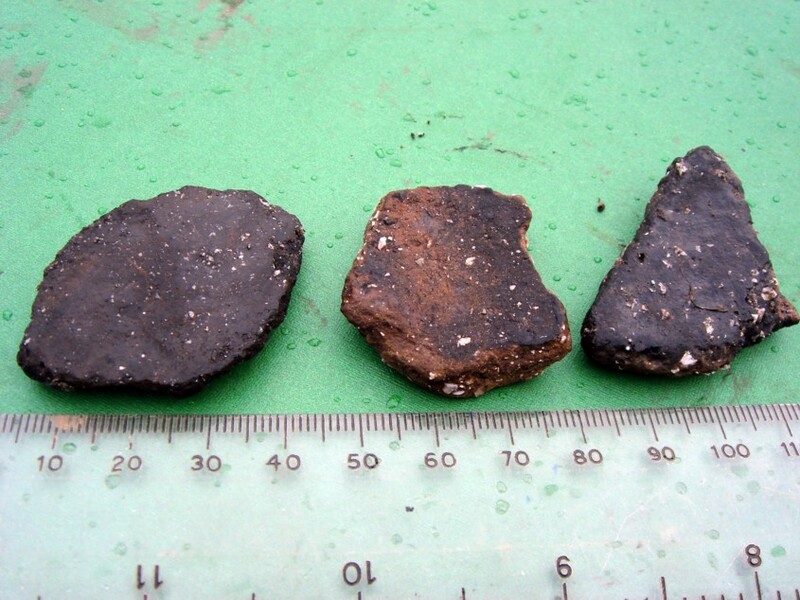 In both cases the ditch was relatively shallow but yielded fragments of what might be Late Iron Age pottery - although this kind of pottery was also made post-Conquest. 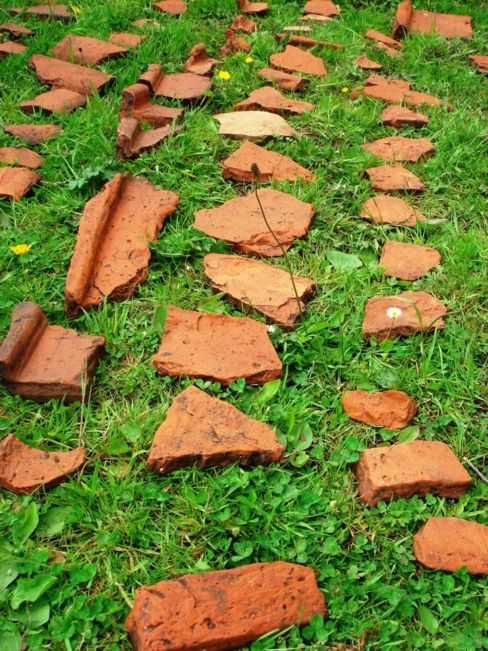 Two of the trenches also produced a large amount of Romano-British roof tile fragments, together with some floor tile and also flue tile, indicating under-floor (hypocaust) heating. The building material was in roughly two types of deposit. There was a thin layer about 30cm below the present soil surface, probably representing scattering by ploughing, and at a deeper level of 40-50cms which was deliberate dumping, perhaps in the earlier enclosure ditch. Other interesting finds included several Romano-British pottery fragments, two sestertii dating from the reign of Trajan (98-117AD), an intaglio stone from a signet ring with an incised carving of a goddess or dancer, quern stones, and several prehistoric worked flint flakes and 'blades'. Overall, this has been a good start to our investigation of this site. 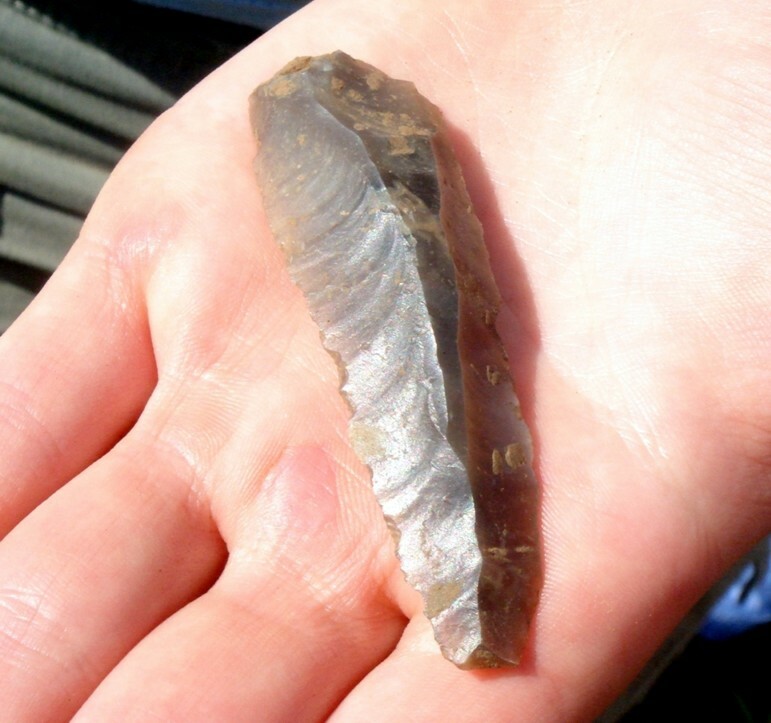 Our finds indicate that human occupation probably spanned at least the period from Neolithic through Iron Age to the Romano-British period. During the latter period there appears to have been at least one villa and/or a bath house on the site, as indicated by the flue tile fragments. We expect to continue work in the area this autumn. The Society has successfully used a TR/CIA resistivity meter for a few years now and we have completed surveys at several sites. Recently, the manufacturers adapted the meter so that it can be used in a different configuration to produce vertical electrical sections instead of the normal horizontal picture. The main advantage of this is that we can look vertically into the ground up to a distance of 3 metres while the twin probe array only responds to features buried at a depth of 0.5 metres or less. 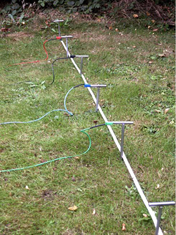 This means the Wenner Array set-up is good for investigating ditches and buried walls. In mid-2008, CVAHS purchased the additional equipment and software to convert our existing meter to handle the Wenner Array mode. 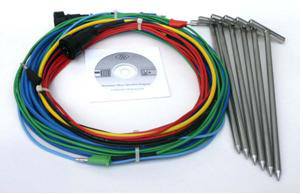 The same resistivity meter is used but with additional cables and up to 20 metal probes. To generate a section, a number of probes (usually 20), are set out at regularly spaced 1m increments along a line. The meter is then used in the Wenner configuration to record all the measurements possible along this traverse of 20 probes. A total of 57 readings are logged using the meter, at six different separations. 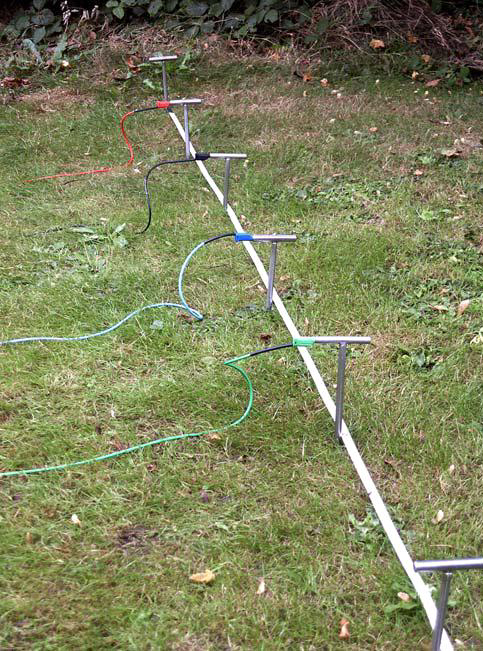 First 1m, then 2m and 3m and so on until a maximum of 6m separation along the traverse, the probes remaining in position until all the readings are taken. The data is then downloaded on to the computer, processed and saved in the appropriate format for the next stage. To produce the final "pseudosection" the data is "inverted" using a special program called Res2Dinv. The equipment was used successfully during our recent excavations in Sarratt. 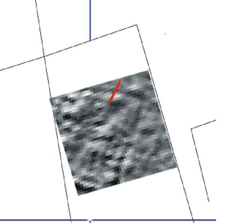 From the resistivity survey we identified a rectangular enclosure, which is outlined by what is interpreted as a small ditch. We then used the Wenner Array to investigate further. The above figure shows the location of the Wenner Array profile across the northern end of the enclosure and below is the profile result. The result indicated that the ditch was a shallow feature. This interpretation was confirmed by our subsequent excavation some metres to the south east of this location. Entitled Excavation of an Earthwork in Common Wood, Penn, and Discovery of a Romano-British Settlement, it describes our work carried out between 2003 and 2005. The major archaeological feature of Common Wood is an earthwork enclosure located on a hilltop plateau. Excavation led to the discovery of a Romano-British settlement. An initial topographic survey revealed a subrectangular enclosure of about 1.5ha with a substantial outer bank, an inner ditch, a pond on the west side and a conspicuous, outward turning, entrance on the south side. Excavation across the ditch in an area close to this entrance led to the recovery of quantities of household waste including hearth ash, fragments of jars and bowls dating from the late 1st to early 3rd centuries AD, a brooch and two pieces of quern stone. A metal detection survey of the excavation surfaces and surrounding area uncovered iron implements, possibly agricultural, two more brooches typical of the 1st century AD and coins dating to 1st to 3rd century AD. 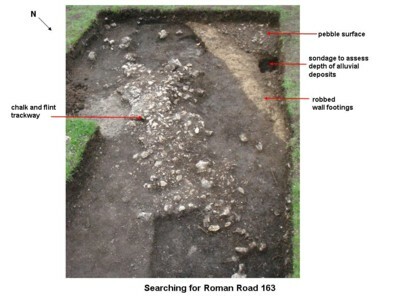 The excavation of what appears to be a dump of tap slag and furnace fragments associated with other Roman-British refuse, points to a connection between the people living in the enclosure and iron working. A very well attended Open Evening in March 2008 heard talks by members of the Field and Records groups on their activities in the past year. One highlight of the evening was a display of finds by Matthew Wildman, a metal detectorist who is a member of the society. 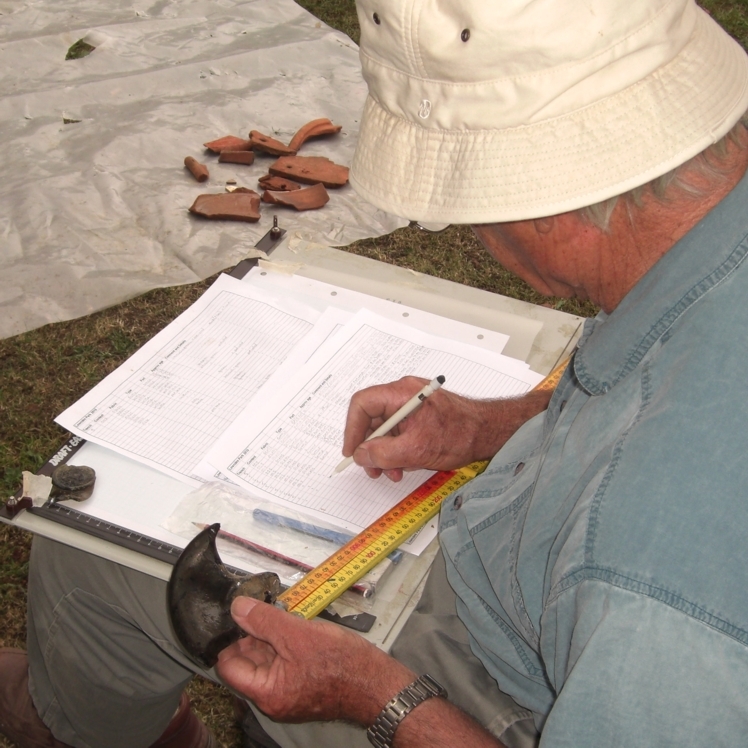 He works closely both with CVAHS and with the Buckinghamshire County Archaeology Service. 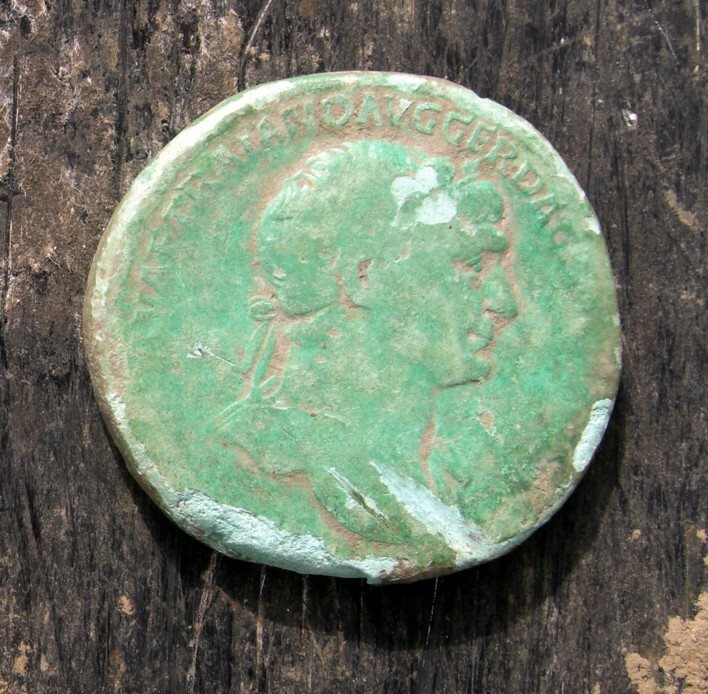 Matthew has been searching for finds in the Chess Valley for about two years now and has amassed a fascinating collection of Roman and medieval coins and metal artifacts. 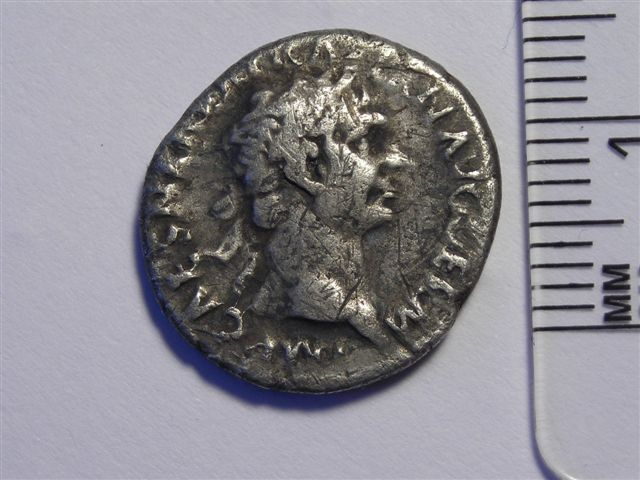 His coin finds run from Republican (pre-conquest) right through to the end of the Roman period in Britain, which confirms the long period of settlement in the area. CVAHS were invited by the owners of a private property in Sarratt to investigate the presence of a Roman road believed to run across their orchard.. The suspected road is the Viatores (1964) Roman Road no.163 Verulamium to Silchester road where it crosses the river Chess and passes through Sarratt. We performed a resistivity survey in late 2007 which revealed some interesting anomalies, and followed it up with two separate digs during March 2008. One trench exposed a packed flint and chalk trackway running alongside a robbed out wall footing, but unfortunately we found no dating evidence. One mystery was that we uncovered a large number of old buttons across the site, mostly of bone and probably around 200 years old. Was there an unrecorded button factory here, or did somebody lose their button box? The probable answer is interesting. During the 18th and early 19th centuries, the mills along the Chess were dedicated to making paper. Rags are a key ingredient of paper and the buttons would have been cut off of old clothes and discarded during the manufacturing process. For the past two years we have been conducting an extensive geophysical survey near the Chess at Sarratt. This has revealed numerous indications of tracks, walls and buildings. A vast array of Roman coins and artifacts have been found in this area since the 1960s and we are pretty sure there was a significant Romano-British settlement here. In February 2008 we finally started subsurface work with a small test pit in an area where Roman tiles had already been found. 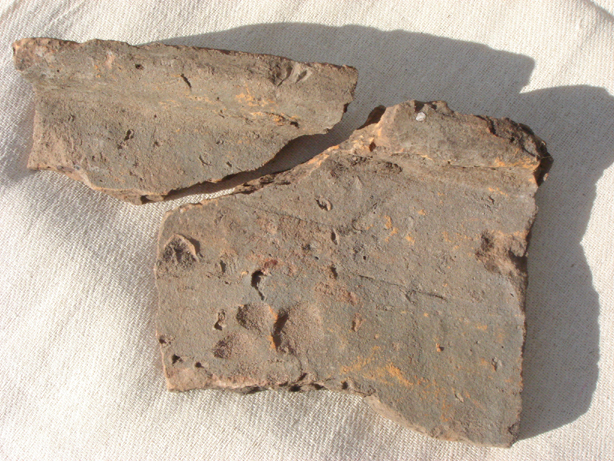 This quickly uncovered several undated pottery sherds, a tile with the imprint of a hobnailed sandle, and another with a paw print, probably of a dog. We are very hopeful that a more comprehensive excavation in summer/autumn 2008 will reveal much more about this fascinating site.